Engines on Expedition - Why is Diesel best? Many people see the diesel engined 4x4 as a superior vehicle, not least because the diesel engine's strengths appeal more to driving in an off road, expedition environment. Most Land Rovers are diesel as standard, but why? 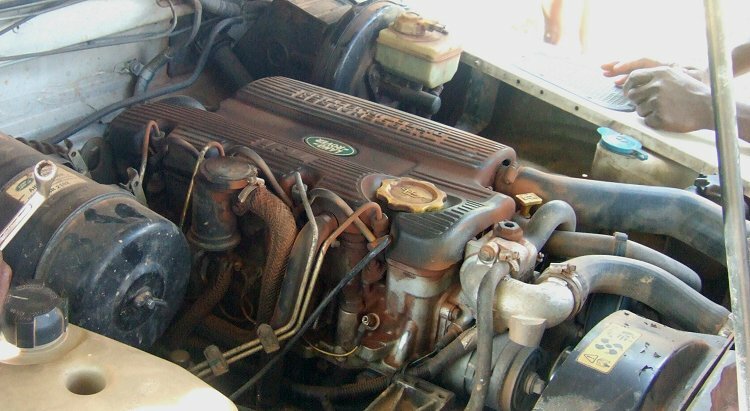 This article is a run down on main strengths of diesel engines on expedition and what that means in the real world. Diesels have most of their torque at low revs, wheres petrol engines get more torque at higher revs. This means that as you would think in a petrol car, the more you push the accelerator, the faster the car goes. However, in a diesel engine, the more revs you have, the more the power disappears so the use of gearing is more extensively needed to keep the engine in the optimum number of revs for more power. This is why Lorries have many more gears than a car has. Since this is the case, many diesel engines and Land Rovers since the 80's, have Turbochargers fitted to increase the power at higher revs so that less gears are needed to achieve a given speed. Although at the lower revs, acceleration still suffers as a higher engine speed is needed before the turbo starts working - somewhere in the 1400-1800 rev range depending on the engine. Whilst it may seem that diesels are inferior engines from a performance perspective, having more torque at lower revs means they are better for moving heavy loads at lower speed, such as towing trailers or crawling over uneven terrain uphill. Having the strength at lower revs mean that the engine is more in control when traversing tricker off road sections, which will naturally be at a lower speed. This strength also has the benefit that they have better engine braking down hills, requiring the brake less and forgoing any skidding situations. Diesel engines are generally considered more reliable, as they are built more robustly to withstand higher compression ratios in the cylinders, and can easily be seen to go over 250k miles if looked after. Although the initial price of buying a diesel engine is more from the outset Litre for litre, they are considered to have better fuel consumption for a similar size petrol engine. In the UK, diesel fuel is generally more expensive, in most parts of the world it is cheaper than petrol. Petrol engines run by the pistons in the engine compressing a mixture of petrol and air in the cylinders. A spark is produced at the optimum time which explodes the piston downwards, creating the driving force. A diesel engine differs as it has no spark to ignite the fuel, ignotion occurring due to immense pressure and heat inside the cylinders. If a battery goes flat in a diesel, it's not a deathknell of hopelessness. Diesels don't require a electricity to ignite their fuel, even a faint glimmer of amps from the battery is enough to open the fuel solenoid so that a good push, tow or roll downhill will get the engine going in gear. This means it has strength when wading in deep water, as the engine won't cut out from having shorted electrics. The engine can essentially run underwater, as long as it can breathe through a raised air intake and the exhaust can escape. If you happen to be camping out in the bush, carrying diesel in jerry cans poses less of a fire hazard than petrol does due to not being volatile. Petrol comes in many guises of quality, with most petrol engines requiring a minimum octane level to work. For a diesel engine, diesel is diesel, and in some of the more backward places you may visit on expedition, diesel is more likely to be found and pumping in a tankful of the local stuff is not an issue. The only thing that may be required is a more frequent oil change for high sulphur diesel fuels. An exception to this may be the USA, where gasoline rules supreme and diesel is generally only available in truck stops. For a given amount of fuel and engine size, a diesel is generally more economical meaning that you can either take less jerry cans along for the ride, or can travel further afield without worrying about filling up.